For the long-distance hunter, success in the field always begins at the shooting range. It would be great if every shooting range was designed so you could practice from 100 yards all the way out to 1,000 yards. The reality though, is that most ranges only offer rifle venues out to 100 yards, especially older ranges built before long-range shooting became so prevalent. A shorter range doesn’t have to limit your preparation though. Using a ballistic calculator like the BallisticApp, your practice time at 100 yards can effectively prepare you for that longer-range shot in the field. When you get to your range, enter your basic inputs into Ballistic, including bullet weight and type, atmospheric conditions, and sight height. 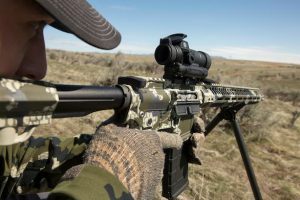 Then, using your hunting rifle-optic set up, plus your hunting ammunition, zero your rifle at 100 yards, generating as tight a three- to five-shot group as possible. Now, use a high-quality chronograph to determine your muzzle velocity; ten shots through the chronograph will provide the ammunition’s average velocity. Add this velocity number to your Ballistic inputs. The next steps is to mimic field conditions with realistic game animal targets. While standard target practice is important, game animals don’t have bullseyes pasted to their vital zones. So, set up a life-sized animal target (there are many available today) at your 100-yard distance. Most of the better realistic targets even have the vital zones outlined. Once you can effectively place your shots where needed, switch to a smaller animal target. A one-half- or one-quarter-sized game animal target will help prepare you for what the animal will look like in the field, at distance, through your scope. Once you get to your actual hunting area input your 100-yard zero into your Ballistic workup for your load, and it will show you the bullet’s drop at various distances. Let’s say the 200-yard listing shows a 2.5-inch drop from the 100-yard zero. Adjust the elevation on your optic according, in this case plus 2.5-inches, and you should be right on at 200 yards. Lastly, always make sure to redo your Atmospheric inputs for local conditions, and Ballistic will provide the precise data you need to take your trophy at long distance.